You are here: Home / Features / Next: When does a restaurant become like theatre? Could such a concept work in Europe? When does a restaurant stop being a restaurant and become like theatre? Are customers ready to pay in advance for their meal just like they do when they go to a theatre performance, music concert or a sports event? Can such a concept work? Next Restaurant in Chicago is not your typical restaurant. The brain-child of the people behind Alinea and run by award winning chef Dave Beran, they have been experimenting with selling tickets instead of serving people ‘a la carte’ since 2011. They can probably do that given that they change the menu and restaurant concept every three months. While the concept is now 3 years old, the restaurant has an incredible business model which celebrates creativity not only in its payment model but also by completely changing the whole concept and theme of the restaurant every three months. What is incredible about Next, however, is not just the concept behind the payment model. Every 16 weeks, the restaurant is changed completely. Since they launched in 2011 they have never served the same concept for more than three months. “It’s like a crazy theatre set,” Dave Beran said. Would such a concept work in Europe? And would it work anywhere else in the United States? It is difficult to say though the issue of ‘no shows’ in a restaurants is one that has stirred a lot of emotions recently because it is becoming a problem that is more and more pronounced. “This is a niche concept because we sell tickets. It’s like going to theatre or a sports event. You need to go online and book your ticket. When you do so, you buy a ticket for the whole service including the drinks. The prices have over the past years varied from around 85 US dollars to 385 US dollars. It depends on the food on offer. We are also experimenting with different prices by time and day. The price on a Wednesday would be cheaper to that on a Saturday evening. This allows us to have a predictable and steady flow of customers that allows Next to offer a great deal more than we would otherwise do at such prices,” Beran said. Next is also selling season tickets as part of its offering. When they created the first concept, Paris 1906, they dedicated it to George Auguste Escoffier. “We started with his original recipe book and we created a menu from there. We needed a strong introduction to our restaurant. People were familiar with Alinea but we wanted to create a new identity for Next,” Beran said. Preparing the food menu and training the staff takes just two to three weeks of work which is incredible when you think that they would be serving people while preparing for the next concept. Beran said that after creating a classy feeling for the Paris setting they had to create a complete change of scenery for their Tour of Thailand which focused on ‘small snack bites’ and street food. Their next concept was a menu which paid homage to el Bulli, the Spanish restaurant which paved the way for the modern cuisine we have come to know today. Beran said that they came up with a menu which served a course from every year of service. Beran showed these incredible videos of their work during his presentation in Zwolle. He said that once you have the story, the food then quickly falls into place. What is interesting about the concept is that guests are immediately warned about any allergies that the restaurant cannot cater for. So if you cannot eat some things, you may have to give it a miss. They have also created a “Bocuse d’Or menu”, bringing food back home by creating the feeling of a Chicago Steak house and also a Chinese modern menu. 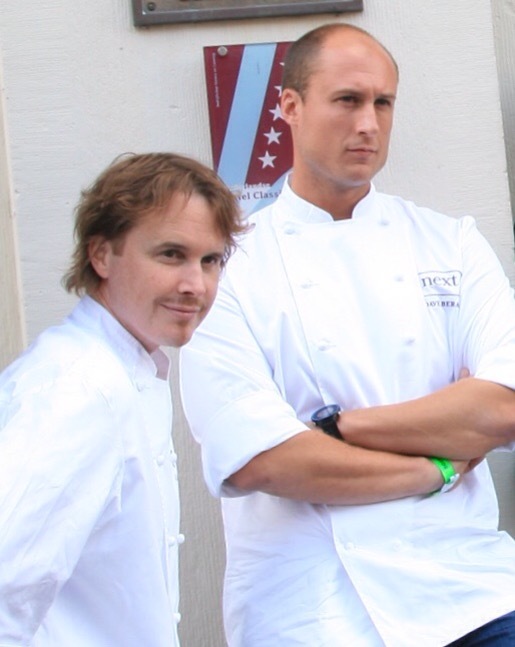 What Beran presented, and which was followed by Achatz a day later, was a unique concept that has been working for the past three years. It is not yet mainstream but this may well be the future of dining out. Only time will tell whether this concept will be successful. Note: For all videos from Next restaurant, Food and Wine Gazette recommends that you search on You Tube under the Next Restaurant channel.